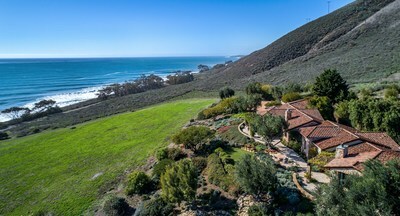 NEW YORK, March 21, 2019 /PRNewswire/ -- A 113-acre ranch featuring a Spanish-style home designed by master builder Bob Curtis located outside sunny Santa Barbara, California will sell in April via Concierge Auctions. Hollister Ranch is currently listed for $17.8 million and will sell Without Reserve in cooperation with Billy Long of Ranch Marketing Associates. Bidding will be held April 26th-30th via conciergeauctions.com. The exclusive ranch includes Agricultural Preserve tax benefits as a result of the Williamson agricultural tax act. "The massive and coveted estate offers unmatched views and luxurious resort-style amenities," stated Long. "This auction follows our successful sale in Monterey, which attracted global interest and a pool of qualified buyers. I am confident the one-of-a-kind opportunity of Hollister Ranch will do the same." Completed in 2000, 121 Hollister Ranch Road is known for its ocean, mountain, and orchard views, close-knit community, and large plots of property. The Spanish-style estate's architectural features include high ceilings, vast windows, Rocky Mountain bronze door hardware, Steven Handleman Studios-designed lighting fixtures and fireplace screens, 7-foot "knotty alder" doors throughout, and warm-toned "old world" plaster. The five bedrooms include a spacious master suite comprised of three rooms, a wood-burning fireplace, large walk-in closet, build-in bookshelves and cabinets, a master bath with an oversized Jacuzzi tub and huge resort-style steam shower and heated travertine flooring; three open-front en-suite bedrooms with travertine countertop vanities and wood and heated tile flooring; and a mountainside Murphy bedroom or office with an en-suite bathroom containing a tub and walk-in shower. Interior features also include a gourmet chef's kitchen with a butler's and large walk-in pantry, custom-height Cherry cabinetry, and two dishwashers, ovens, and sinks; and a fully-finished two-car garage with built-in cabinets, benches, space for a wine cooler, extra refrigerators and freezers, and a separate room for shop or water toys. Expansive portrait windows frame the Santa Monica Mountains, islands of Santa Cruz, and Santa Rosa and San Miguel. Outdoor amenities include a colored concrete driveway with space for six vehicles, an expansive pasture area surrounding the home with opportunity to build equestrian facilities and a helicopter pad, sited guest house with water access, mature Mediterranean landscaping, sand volleyball court, fruit orchard with extensive irrigation, uniquely-designed sitting wall, and two ivy-covered pergolas. For more information visit ConciergeAuctions.com or call +1.212.202.2940.